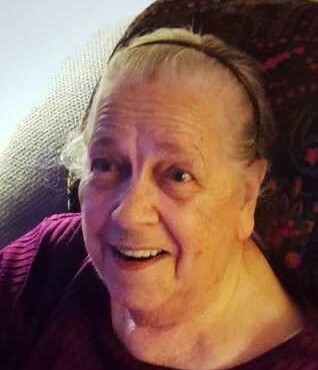 Mary Ellen Pfeiffer, 87, of Boonville went to be with Jesus Thursday April 4, 2019 at Ashley Manor Care Center surrounded by her children. Visitation for Mary will be Saturday April 6, 2019 at the Santa Fe Trail Baptist Church from 10:00-11:00 a.m. Service will begin at 11:00 a.m. with Rev Ken Tounzen officiating. Burial to follow in Walnut Grove Cemetery. Mary Ellen Pfeiffer was born March 12, 1932 in New Franklin, Missouri, the daughter of William Thomas Miller and Maude Mae Chamberlin Miller. She married Logan Pfeiffer on February 28, 1948 in Boonville, Missouri. Mary loved to sew and crochet, she also enjoyed listening to KWRT Party Line and reading the Bible. She was a faithful member of the Santa Fe Trail Baptist Church of Boonville. Her favorite time was spent with her family. Mary was preceded in death by her parents William Thomas Miller and Maude Mae Chamberlin Miller, husband Logan Pfeiffer, son David Lee Pfeiffer, brothers Harold T. Miller, Charles F. Miller and Vincil Miller, sister Lorene Taylor, son-in-law Robert Gerding, grandchild Jason Steding, and great-grandchild Terra Steding. She is survived by her son Logan (Betty) Pfeiffer of Boonville, daughters Eileen (Earl “Butch”) Kirkpatrick of Boonville, Nelda Gerding of Boonville, Mary Ann (Gary) Goff of Bunceton, and Diana (Ron) Murdock of New Franklin, brother Earl Eugene (Dee) Miller of Kansas City, Kansas, Grandchildren James Aaron (Katherine) Kirkpatrick, Rebekah Kirkpatrick, Joshua Kirkpatrick, Matthew (Sandy) Pfeiffer, Bradley (Michelle) Pfeiffer, Ferris (Kimberley) Pfeiffer, Anne Pfeiffer, Bethany (Paul) Kensinger, Brian Gerding, Randall Moehle, Michael Goff, Sara Johnson, Wally (Jamie) Inskeep, Jade Murdock, Brian (Hollie) Murdock, Tracy (Adam) Price, David Ryan (Tilena) Pfeiffer, Carrie (Don) Pfeiffer, Brenton Pfeiffer, and Chris (Kami) Pfeiffer, great-grandchildren Elanor Jane Kirkpatrick James Aaron Kirkpatrick II, Edmund Arthur Kirkpatrick, Winston Phineas Kirkpatrick, David Benjamin Kirkpatrick, Robyn Pfeiffer, Quinci Cox, Logan Pfeiffer, Abigail Hinshaw, Peter Hinshaw, Kinser Pfeiffer, Jack Pfeiffer, Natalie Pfeiffer, Eva Kensinger, Brody Kensinger, Kayla Moehle, Matrix Moehle, Tyler Moehle, Jessica Shullmeyer, Mckenzie Steding, Zack Steding, Kerrie Steding, D’cymber Joy Steding, Summer Storm Johnson, Abby Inskeep, Madi Inskeep, Bryson Inskeep, Lily Murdock, Zach Murdock, Adam Murdock, Alex Murdock, Alexis Durham, Mercedes Durham, Addison, Keerstin, Arica, Kyle, Abby Price, Davina Pfeiffer, David Oscar Pfeiffer, Kathleen Rose Pfeiffer, Alexandra Pfeiffer, Vanessa Pfeiffer, Chloe Pfeiffer, Kristopher Pfeiffer, Korben and great-great grandchild Audrey Nichole McNeal. Memorial Contributions are suggested to the Santa Fe Tail Baptist Church.